In spite of our best efforts here my friends we do not seem to be convincing the world that I no longer have the health to work in this field. I pass that responsibility to colleagues who- have been trained. In the meantime I post announcements of important events that I have already responded to. The ONCE Foundation works since its inception to contribute to the full social inclusion of people with disabilities, giving effect to the principle of equal opportunities and non- discrimination. Within this context, the ONCE Foundation has decided to organize the V International Congress on Tourism for All, in collaboration with the UNWTO and the European Network for Accessible Tourism, and the VI International Congress of Design, Technology and Research Networks for All in order to join forces and leverage the synergies that can be generated from both Congresses, from 23 to 25 September 2015. The V International Congress on Tourism for All has as its central focus New Technologies and Tourism for all, Solutions and Technology Applications in Tourism for All. We contact you as we consider you an expert in tourism and accessibility. We would like to ask you for your collaboration forming part of the Scientific Committee of this Congress. 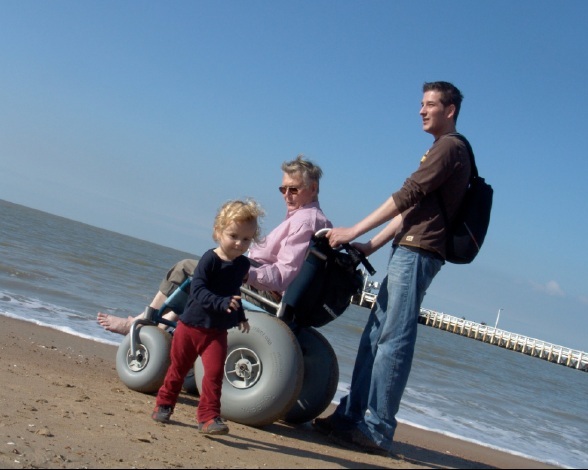 [I have been invited] to study the travel barriers and facilitators for people with SCI. It's a 2 year project and I am forming an Advisory Board to monitor the progress of the study. Would you be interested in serving on the Advisory Board? I'll be honored to have you as one of the board members based on your expertise and travel experiences. Also since that the host organizaed the accessible tourism to "Jiuzhaigou Valley Scenic and Historic Interest Area" for over 300 PWDs last year in 2014...They are going to organize on 14th~16th, May right after the Forum. Please note that the host would like to invite [you as the] speaker who is from United States. Note: I have responded to each of the above and assigned my substitutes. Do not contact the organizers. I post these events with dates so that you are aware of the quality of attention now being given to Inclusive Tourism as a result of our 10 years of work together. Keep your momentum up for the next 10. From May 14 - 23, 2014 I will be traveling through Nepal providing technical assistance to the tourism industry on accommodating travelers with disabilities. This video is courtesy of the National Federation of Disabled Nepal - NFDN, the Government of Nepal, the Disability Working Group of Association of INGOs in Nepal and UNICEF. Focusing on physical accessibility it was produced for the Career Expo for People with Disabilities in Nepal, December 2013. From May 14 - 23, 2014 I will be traveling through Nepal providing technical assistance to the tourism industry on accommodating travelers with disabilities. This post looks at living with a disability in Nepal. Nepali disability advocate Nirmala Gyawali speaks from inside her culture on attitudes toward disability. Nirmala speaks on the simple act of crossing the street in this video. This video, "Challenging the Cultural Stigma of Disability in Nepal" documents projects done with Nepali disability activists by Robert Rose of Seattle. There are many people who find that fishing is more than just a hobby. It is a way of relaxing and enjoying what life is all about. The feeling of being outdoors is nothing short of perfect and should be enjoyed by everyone. It has been proven that fishing increases attention span, offers social inclusion, a sense of achievement & motor skills development. There are some wonderful global fishing destinations and the Caribbean is a favourite. Aruba, Bahamas, Dominican Republic, St. Lucia, Bermuda and Barbados all have the perfect setting for fishing itineraries. Barbados, however, is the island taking the lead with it's "Fully Accessible Barbados" initiative. 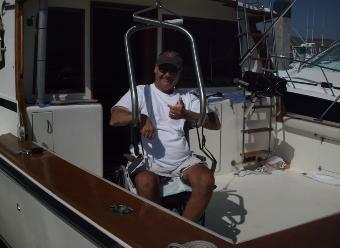 "Fishing is a fact of life" in Barbados so what better time to introduce "adaptive fishing" than now. For those who are blind or have vision impairment, meet Lawrence Euteneier, - a gentleman who has been registered as blind since the age of 8 years old. 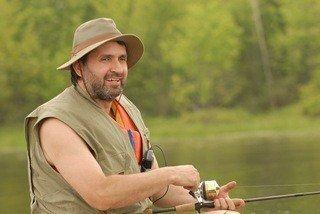 Lawrence specializes in arranging guided fishing adventures for persons with limited or no sight. 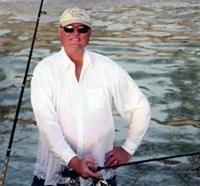 Lawrence says blind fishing is all about "feeling the bite". He has spent his life researching and trialing gear and techniques proven effective for fishers with vision disabilities. His guides are trained in sighted-guide techniques and blind etiquette. Adventures can be arranged from one day to two weeks in length and can include equipment rental, sighted guide assistance, transportation, meals and accommodation. Six years later, after designing a wheelchair-accessible boat (Sport fisher) and adaptive fishing equipment, Larry was back fishing on the Sea of Cortez in Mexico. 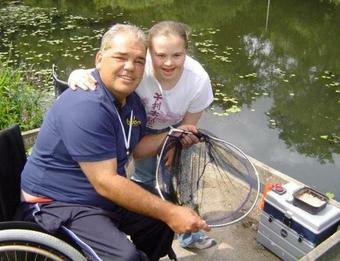 Larry also saw an opportunity to provide others with disabilities the chance to enjoy fishing. Whether it is the excitement of big game fishing, twilight/night fishing for Grouper, Pargo, & Swordfish, diving with the seals or exploring the National Marine Sanctuary after a day of fishing, Larry can provide it all. As well, Larry can also top off an excellent vacation by providing a wheelchair accessible condo Villa Tranquilllo and a wheelchair accessible rental van. In the UK, 54,000 disabled people hold a fishing license, of whom 1,000 fish competitively and the majority for pleasure. One such disability fishing group, The British Disabled Angling Association (BDAA), was founded in 1996 by Terry Moseley to help develop opportunities for people with disabilities to access the activity of fishing in the UK. The BDAA works with its partner organizations to develop new and exciting opportunities in angling participation, from grass roots to competition levels. People who are deaf and who like to fish have started clubs all over the world so they can socialize, plan fishing trips, share experiences and teach others their sport. The National Bass Association of the Deaf has affiliations all over the United States. As well, there is the Ontario Fishing Club of the Deaf in Canada, the Brisbane Deaf Angler's Club in Australia and the Portsmouth Deaf Sea Angling Club in the United Kingdom. The warm waters off the coast of Barbados offer ideal fishing for Barracuda, Tuna, Wahoo, Dolphin (Dorado), and the Marlin species. Spin fishing from the many beaches and inshore fishing from open boats is a popular pastime for Barbadians With this in mind, it would make sense to offer itineraries to accommodate the significant disabled Barbadian population as well as attract disabled fishing fans globally with the lure of appealing, adaptive fishing packages and tournaments. Makeover Suggestion 9: Sailing for Everyone in Barbados? "Sailing for everyone regardless of ability"
There is no more straightforward way to present the "Sailing for Everyone" philosophy emanating from Victoria's Dockland Yacht Club than to give it to you verbatim below. It has taken root in China Ai Hung Hai (I Love Sailing) on one side of the globe and France's La Voile Ensemble (Sailing for Everyone) on the other. "Sailability Victoria - Sailing for Everyone" grew out of the need to the re-think entry level sailing, to simplify everything, to return to the basics. In today's world of seemingly unlimited choice, we have to encourage people into a new activity, not threaten them with confusing rules and jargon and reward them with a dunking. The philosophy of "Sailing for Everyone" has found expression in an organisation known as "Sailability" which itself began as sailing for the disabled, then grew into facilitating sailing for people with disabilities, and finally blossomed into sailing for everyone, regardless of ability. We have now amalgamated with Sailability for a cohesive front to promote sailing for everyone, including the disabled, worldwide. Access Sailing Club Inc is a member of the Victorian Disabled Sports Advisory Committee and the charity of the Victorian Boating Industry Association's melbourne Boat Show. As an incorporated entity it facilitates its branches to own their own property, primarily sailing dinghies and safety craft purchased through sponsorships from local businesses and service clubs, and maintains the organisation's insurance policies. Currently we have branches at Docklands, Bennala, Ballarat, Warnambool and Portland with more evolving all the time. Club established at Docklands, Melbourne merging with the Docklands Yacht Club. For any feedback or requests, please e-mail Web Manager, Colin Johanson. Walk a mile or two in the shoes of Jeff and you will be opened to world of touch and sound that is rich and literally "overlooked" by those who are profoundly sighted. This video by Accessible Media sneaks in a powerful message of inclusion in this video "Jeff's Day." What would it be like if a cruise line created a set of videos with this quality of environmental description for each of its ports-of-call? How about if someone started by doing a proof of concept video in Barbados? "Do you know what my favourite part of the game is? Barbados has been synonymous with cricket since the 1800's so it was not surprising that the island was also in the forefront with it's creation of the first blind cricket program in the Caribbean in 2001. There have been many "firsts" for Barbados, so at a time when global awareness of accessibility and inclusion are at the forefront, might Barbados once again demonstrate its leadership by expanding its blind cricket program to include an all disability program? The earliest cricket may have developed by the 8th century or earlier from ancient bat-and-ball games from the region between North India and Pakistan. The trend traveled through Persia (now called Iran) and into Europe and Great Britain. Initially, the game was called "creagh" or "cricke" by the Normans who conquered England in 1066. Cricket was banned from 1300 - 1500 A.D. as monarchs and British barons favoured archery (which would serve as a military advantage) over "such a disreputable activity that only idlers, gamblers and dissolute characters played". Outlaws such as Robin Hood were rumoured to having been excellent players along with famous political leader Oliver Cromwell. Interestingly, the idea of "adaptive sports" came in the form of deaf cricket as far back as 1895 when the first deaf cricket interstate match was held in South Australia. In Great Britain, deaf cricket started out as a Great Britain Team (part of the British Deaf Sports Council) with a trip in 1988 to the West Indies by a squad of 15 players to play some matches against local teams. In 1922, blind cricket was developed by Australia. At the time of a Test Match, two creative residents thought "blind people could play cricket as well, and put rocks in a tin can" and began to play a crude version of the modern day cricket . Blind cricket has also been played in England and Wales since the 1940's. While the England and Wales Cricket Board, established in 1997 in the U.K., is the single national governing body for all cricket in England and Wales and provides access to the sport of cricket for persons with disabilities, the British Blind Sport (BBS) and Blind Cricket England and Wales (BCEW) are the organizations who are responsible for the day to day running of the sport. in the country and works with professional players and coaches in assisting players with disabilities in training and competition . One of the newest programs HCB has launched is the Bluebird Care Elite Player Development Program for cricketers with disabilities who have international potential. Hampshire Talented Athlete Scheme was formed to provide support services to these talented athletes based on their performance levels. The HCB also supports the Hampshire Visually Impaired Cricket Club in providing opportunities for the blind and partially sighted. Cricket for Change was setup in 1981 and targets disadvantaged youth as well as disabled youth. Just recently, the team has traveled to Trinidad and Tobago to introduce a new program called "Street20" which is a crime reduction program proven to be very successful in the U.K. As well, the team traveled to Jamaica in 2009 to launch The Courtney Walsh Foundation which replicates the Cricket for Change programs specifically for males and females 18 - 21. In disability cricket, the rules and regulations are disability specific, however there is no recognized international cricket for people with physical disabilities at the present, therefore the rules are based on a domestic structure called DSE profiling system for athletes with physical impairments also known as the Coaches Guide to Functional Ability. Barbados already receives recognition for its excellence in regular and blind cricket as well as being a cricketing destination. Through the "Fully Accessible Barbados" initiative launched by the BCD in 2005, Barbados has taken leadership in creating a culture of inclusion. The island is also known for its mantra of "can do" in the cricket world. The cricket community along with the regular community has recognized and acknowledged what talented cricketers can contribute to the game rather than what their limitations are. With 14,000 persons with disabilities on the island, (in England and Wales there are between 3,000 and 4,000 persons with disabilities playing regular or occasional cricket at present), creating an all disability cricket program would be welcomed. Such a program would give persons with all types of disabilities an opportunity to play the sport of their island where they could develop their self confidence and social skills. As well, the camaraderie along with the exhilaration and excitement of international competition can be experienced for the first time. The island could draw on the expertise of other cricket boards such as the Hampshire Cricket Board and the English and Wales Cricket Board. As well, Barbados could seek the support and input from non profit organizations such as BARNOD, Barbados Council for the Disabled, Disabled Peoples' Organization of North America and the Caribbean (DPOC) and Disabled People's International. There are ample resources to access with the deaf, physical, learning, and emotional disabilities programs already in place. The combined efforts could serve well to set the ground work for education and training programs to encompass all the Caribbean islands and beyond. On May 31, 2011, Hampshire Cricket announced that the Barbados Tourism Authority will become the Official Twenty20 Shirt Sponsor and Travel Partner to Hampshire Cricket and The Rose Bowl. Upon a previous visit to Barbados, Hampshire Cricket Group Commercial Director, Zac Toumazi said that Barbados' facilities and hospitality were "second to none" and that "We hope that, in our own way, we can bring awareness to the jewel in the Caribbean that is Barbados." If Barbados were to host all disability cricket tournaments, the potential for increased tourism would be significant. Regular cricket teams already visit Barbados annually and Test matches, especially between England and Australia alone bring in thousands, so the numbers would increase substantially. In conclusion, creating a disability cricket program could reaffirm Barbados' position as leader in accessibility, inclusion and adaptive sports in the Caribbean. Moreover, this positive endeavour could contribute significantly to the enhancement of the initiative of "Fully Accessible Barbados". The United Nations World Tourism Organisation (UNWTO) is convinced that the facilitation of tourist travel by persons with disabilities is a vital element of any responsible and sustainable tourism development policy. Announcing a new tri-lateral agreement with external partners, Fundación ONCE and the European Network for Accessible Tourism (ENAT), the UNWTO aims to provide guidance in this area to policy makers, destinations and tourist enterprises. Do Caribbean states measure up to customer needs once passengers disembark en masse from the cruise ships, saunter leisurely from yachts, or tumble expectantly from airborne sardine cans? Although there is little evidence as prominent as Barbados' Fully Accessible Barbados each island has a degree of awareness. To what degree is this awareness institutionalized in the policy, staff, and programming of the Caribbean Tourism Development Company? The Caribbean Tourism Organization (CTO) and the Caribbean Hotel and Tourism Association (CHTA) are relaunching their marketing and business development unit, known the Caribbean Tourism Development Company (CTDC), a jointly owned and operated, private, for-profit entity created in 2007. The revitalized CTDC will market the Caribbean brand through licensing, merchandizing, advertising, and the sale of vacations via its website. The website, which will be redesigned, will include among other features, an integrated booking platform that specifically caters to the Caribbean's smaller hotels. One of the new CTDC's emphases in the initial stages will be on reviving intra-Caribbean vacation travel. Funding for the CTDC will come from both the public and private sectors, with the joint owners each committing seed funding to be supplemented by CTO member countries. The new CTDC board of directors will include six members each from the CTO and the CHTA, with the leaders of the two organizations, CTO Chairman Richard "Ricky" Skerritt and CHTA President Josef Forstmayr, as co-chairs. The CTDC is a marketing and business development unit owned equally by the CHTA and CTO. Its mission is to own, promote, protect, advance and enhance the Caribbean brand. The CTDC combines the resources of the Caribbean region's destinations, accommodations and service providers to create a cohesive business unit that is able to identify commercial opportunities and allow the members of CHTA and CTO to benefit collectively from those opportunities in ways that individually they could not. In all its endeavors the company will engage only in activities that honor the Caribbean brand and benefit the members of CHTA and CTO. For more information, visit www.caribbeantravel.com.